In its verdict, the Centre for Democracy and Development (CDD) declared that the rerun did not meet the minimum standards for free, fair and credible elections. The just-concluded Osun State governorship election was freely unfair. Like some blind men who touched the elephant in different places and came up with different accounts of how it looks like, the verdict on the election has been variegated. It depends, to a large extent, on one’s political leaning and interest. But in all this, truth will always stick out and will always prick the conscience of the nation. The Independent National Electoral Commission (INEC) had declared the first poll inconclusive. The candidate of the Peoples Democratic Party (PDP), Senator Ademola Adeleke, had won by a slight margin. In the rerun held in some seven polling units last Thursday, September 27, 2018, INEC declared the All Progressives Congress (APC) candidate, Gboyega Oyetola, the winner. He scored a total of 255,505 votes as against Adeleke’s 255,023 votes. The difference was just 482 votes. 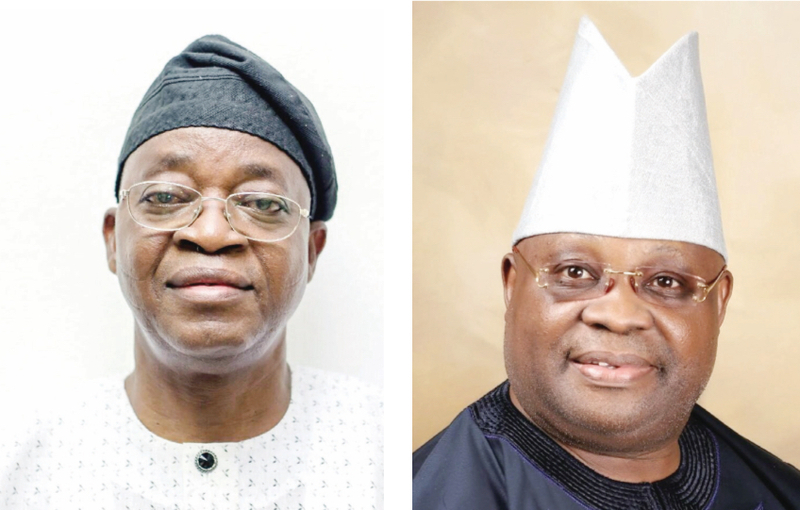 In the first poll held on September 22, 2018, Adeleke led Oyetola with 353 votes. To the opposition Coalition of United Political Parties (CUPP) and the PDP, the rerun was a show of shame and a black day for Nigeria. The CUPP expressed worry that INEC and security agencies allegedly turned themselves into organs of the APC. An impartial and independent observation of the election puts a question mark on where our democracy is heading. The missions of the United States, European Union, and the United Kingdom that monitored the election said there were incidents of intimidation and harassment of voters. The US Consul-General, Mr. John Bray, who read the missions’ joint report, expressed concern over the reported intimidation, harassment of party monitors, journalists and domestic observers. He urged stakeholders to remain calm. In its verdict, the Centre for Democracy and Development (CDD) declared that the rerun did not meet the minimum standards for free, fair and credible elections. It confirmed acts of intimidation by security forces and violence allegedly unleashed by party thugs. Some voters and observers were reportedly denied access to polling units. Security forces, in some cases, even reportedly threatened and arrested field observers. At PU 17, Ward 5, Osogbo, election was disrupted due to reports of sporadic shootings by hoodlums. These, the group said, were suggestive of attempts to compromise the integrity of the poll. The recurring decimal in the allegations of electoral manipulations is the security agencies. They have always allegedly shown bias for the government in power. In the governorship election in Ekiti State two months ago, over 30,000 security agents harassed and intimidated voters such that it put question marks on the outcome of the election. Before the election, the outgoing governor, Ayodele Fayose, had wept at a PDP rally in Ado-Ekiti, alleging that the police manhandled him and beat up anybody who had any sign of PDP on them. “I am in pain, I am in severe pain. I can’t turn this neck anymore. If anything happens to me, the Inspector-General of Police should be held accountable,” Fayose had lamented. Of course, the APC debunked Fayose’s claim, saying it was clearly contrived to give the impression that he was being persecuted. My fear in all this is that what happened in Osun and Ekiti dangerously point to what may happen in the general election in 2019. If we cannot handle clean election in a few wards in one state, what is the guarantee that we will effectively handle elections in all the states next year? The signs are really ominous. Already, the United States Institute for Peace and the International Republican Institute have predicted election violence in places like Lagos, Rivers, Kano, Anambra, Ekiti, Plateau, Adamawa and Kaduna in 2019. In a recent report, the institutes noted that the socio-economic inequalities, ethnic and religious divisions as well as corruption contributed to the risks of electoral violence in Nigeria. The report added that public confidence in the INEC for credible elections was low. It advised the electoral umpire to consider transparent result management and staffing reforms. Will INEC listen? Will the security agencies stop intervening in a negative manner in our elections? The Federal Government must reassure Nigerians that it will sanction any security agent or INEC official that attempts to manipulate our electoral process in the future. It must investigate the role of security agencies in the soured Ekiti and Osun elections and punish the culprits. This is to re-establish confidence in the system. The wishes of the people must prevail at all times. President Buhari must take a cue from the former President Goodluck Jonathan. Despite being the incumbent President then, Jonathan allowed the wishes of the people to prevail by conceding defeat in 2015. This is the minimum requirement Nigerians expect in 2019. Anything short of this will take our democracy back to the Stone Age. May God help Nigeria! I don’t blame Gov. Ambode. He knows very well that he that pays the piper calls the tune. He has shown in clear terms that he lacks the capacity to confront the status quo. So, Your Excellency, why not take a dignified walk and move on with your life? Ambode has tried his best but the powers that be don’t want to see his face. The humiliation is becoming too embarrassing. Good day sir! I am a newspaper vendor and a regular reader of your article in Daily Sun. Based on your advice to the governor, kindly give me free tutorials on how to recover my money from FCT Ad-hoc Committee on Sale of Government Houses. My case is a long story but in summary, I paid the sum of N2.250 million for a two-bedroom flat at Gwagwalada, since April 2008. Till date, I have neither seen the house nor my money. Thank you. Bro Casmir, my wish and demand from Lagosians is a revisit of Agbalajobi and Otedola on Sarumi over Jakande godfatherism. Ambo should damn it and take a jump, he will cross the sea and nothing will happen. It is better to live a day in one’s life than every day as a sheep. Dear Casmir, I was sincerely impressed after carefully going through your frank, insightful and courageous write-up. The overbearing attitude and disposition of Tinubu, to be playing God by selecting, recommending and discarding governors, is too bad and uncalled for. This is not real democracy. Politics of godfatherism under any guise must not be encouraged. However, this is what is obtainable in Nigeria, as this is part of corruption and yet Buhari is not seeing this. Honestly, these are the reasons why I don’t have faith in the Nigeria project. For Governor Ambode, he should be bold enough to call the bluff of Tinubu and then energetically/spiritually and politically confront/fight him to a standstill. This is what Ambode must do now. He must seek and pray to almighty God, recruit either Cuban or Israeli secret agents/ bodyguards, use all his contacts, influence, financial resources, civil servants, political carrots and sticks, incumbency factor, revoke appointment of local government chairmen and swear in his loyalist, etc, before contesting the gubernatorial primary of APC with the Tinubu stooge. If he contests and yet does not win as the Lagos governorship candidate of APC, then history would be kind to him for putting up a fight and making a statement. The other option open to him is to defect with his entire political family structure to PDP and then select/work with a Christian deputy governor from APGA, who could be a Yoruba woman and consult with Dr. Bukola Saraki, who I am predicting to win the 2019 presidential election, if he can pair with either Mr. Peter Obi or Senator Ike Ekweremadu as running mate and both Tinubu and Buhari will be defeated in 2019. Please convey this to those concerned. Thanks. Good bro Cas, Ambode should go ahead and hold unto his belief, after all, Tinubu is human and fallible. Let’s see the power of incumbency and godfatherism at play; but if by any means Ambode beats Tinubu’s chosen one, then it will be clear to all that Tinubu can never hold Lagos State and South West politics hostage anymore. After all, he is not from Lagos State. l believe whatever sins Gov Ambode has committed against his godfather and APC, Senator Bola Tinubu should forgive him to run for a second term so he can complete all projects he has started before they becomes abandoned projects.